This story was updated at 5:47 p.m. EST. Oil and gas companies are seeking a major increase in permits to vent or burn natural gas from wells on federal lands without paying royalties, according to data obtained by Greenwire. The data suggest a growing amount of taxpayer-owned natural gas is literally going up in flames as companies focus development in oil plays, particularly in New Mexico and North Dakota. Over the past three years, industry applications to vent or flare gas -- rather than capture it, send it to market and pay federal royalties -- have risen nearly threefold, according to the data from the Bureau of Land Management. In the past decade, those applications have risen nearly 2,400 percent. The data come as BLM seeks to rewrite a 34-year-old rule to keep more natural gas in pipelines and ensure a fair return to the U.S. Treasury (Greenwire, March 20). The rise in venting and flaring applications underscores the need for a tough BLM rule, conservationists argue. "As companies are pumping higher volumes of oil off federal lands, the evidence is mounting that they're also wasting more and more taxpayer-owned gas," said Matt Lee-Ashley, a senior fellow for the left-leaning Center for American Progress who is a former Interior Department aide for the Obama administration. "BLM's rule cannot come soon enough." But oil and gas officials caution that the burning of gas associated with oil drilling is unavoidable in areas that lack pipelines and other infrastructure to process it. Rights of way for new pipelines often encounter lengthy permitting delays, they argue. The BLM data could also point to an increase in methane emissions from oil and gas development on public lands. Methane, which is the main ingredient in natural gas, is more than 20 times as potent a greenhouse gas as carbon dioxide and accounts for about 9 percent of domestic greenhouse gas emissions. One-third of methane emissions come from the oil and gas sector. Data courtesy of the Bureau of Land Management. Reducing methane emissions -- particularly from the oil and gas industry -- has been a major plank in the Obama administration's climate change platform. 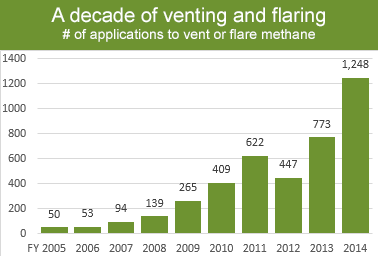 Notably, the BLM applications data do not specify the amount of gas companies are requesting be vented or flared. Nor do they indicate what portion of that gas is proposed for venting, a process that emits far more global warming emissions than flaring. But the BLM data do support the finding last month in a CAP- and Wilderness Society-commissioned study that methane emissions from venting and flaring on public lands and waters have risen 135 percent from 2008 to 2013 -- increasing to 175,000 metric tons (E&ENews PM, Oct. 6). The study by Stratus Consulting was based on an extrapolation of data from oil and gas operations reports that drilling companies report to Interior's Office of Natural Resources Revenue. In response to a Greenwire inquiry, Stratus later estimated that methane emissions on just onshore public lands rose 51 percent from 2008 to 2013. While Interior has neither affirmed nor denied the Stratus estimate, BLM officials have acknowledged that the rise in applications likely points to a rise in actual venting and flaring from oil and gas drilling on public lands. The vast majority of those applications, known as sundry notices, were filed in BLM's New Mexico and North Dakota offices, where companies are targeting the oil-rich Permian Basin and Bakken formations. Both areas have a scarcity of pipelines and processing facilities needed to market natural gas, which at today's prices is less profitable than crude. BLM's current regulations allow companies to vent or flare associated gas that, in BLM's view, cannot be economically captured. In essence, companies are allowed to vent or flare gas -- and pay no royalties -- if the cost of capturing the gas would force companies to forgo oil development and leave a greater amount of taxpayer-owned resources in the ground. Royalty-free venting or flaring may also be permitted if an operator submits a plan to capture the gas within one year. Royalties are not charged because the gas is considered "unavoidably lost." "The BLM continues to carefully review all applications to ensure that they comply with existing rules and that royalties are paid on gas that is 'avoidably lost,'" said BLM spokesman Craig Leff. "The BLM is also working on a proposed rule that would reduce the amount of methane that is vented or flared from oil and gas development on all public lands, promote the conservation of produced oil and gas, and ensure a fair return to the American taxpayer." Increasingly, BLM's field office in Carlsbad, N.M., is forcing drillers in the Permian Basin to pay royalties on the gas they vent or flare, a policy shift that could nudge more companies to invest in new pipelines. In 2008, when gas prices were high, an estimated $58 million in royalties was lost on public lands due to venting and flaring, according to a 2010 report by the Government Accountability Office. About 40 percent of that lost gas could be economically captured with off-the-shelf technologies, the report found (Greenwire, Dec. 1, 2010). BLM is required to minimize waste under the Mineral Leasing Act. But at the same time, BLM's forthcoming rule cannot make oil and gas development uneconomical, agency and industry officials said. The rise in venting and flaring on public lands is in part due to the difficulty in obtaining permits for pipelines across patchworks of federal, state and private lands, oil and gas officials said. "BLM could help fix this problem really quickly by more expeditious processing of rights of way," said Kathleen Sgamma, vice president for government and public affairs at the Western Energy Alliance. Wally Drangmeister, a spokesman for the New Mexico Oil and Gas Association, said much of the increase in venting and flaring applications can be attributed to the uptick in drill rigs in the state, which now number roughly 100. Most new wells are being drilled in the Permian Basin, which lacks gathering lines to transport gas to processing plants, he said. "Flaring is a short-term solution," he said, adding that companies are building pipeline capacity "as soon as we absolutely can." WEA, along with partner trade groups, in May warned BLM that its forthcoming methane venting and flaring rule could be counterproductive to the Obama administration's goals of reducing greenhouse gas emissions if it hinders the production of natural gas, which releases far less emissions than coal when burned for electricity. Coal currently is the nation's largest source of greenhouse gas emissions. And overall, methane emissions from the broader oil and gas sector fell 12 percent from 2011 to 2013, according to the most recent data from U.S. EPA. Click here for a complete table of the BLM venting and flaring data.